A pedestrian has been taken to hospital with serious injuries after being hit by a lorry on a main road into Swansea. Fabian Way was closed for a number of hours with traffic affected on approach roads, including the M4. 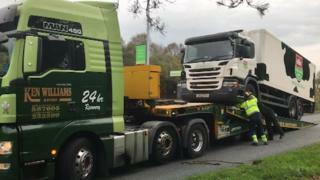 The road was shut between Jersey Marine roundabout to Port Tennant for five hours after the 05:50 BST incident. The Welsh Ambulance Service said the 25-year-old man was taken to the city's Morriston Hospital.